Manufactured and distributed in the USA, Terial Magic is a natural product that makes natural fiber fabric paper like once treated. 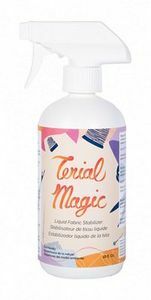 Terial Magic does not contain starch or sugar like traditional stabilizers and therefore can be left in your fabric for an infinite amount of time without worry of molding or attracting bugs to your quilts or craft projects. It makes treated fabric fray free and easier to work with. The possibilities from easy embroidery, quilting, applique' and use with die cutting machines is just the start to this revolutionary product. It's Magic.